The Milwaukee Uprising of Aug. 13-15, set off by the police killing of Sylville Smith, was the most direct repudiation of the outrageous reactionary rhetoric of Milwaukee County Sheriff David Clarke at the Republican Convention. A neofascist like Clarke, or his candidate Donald Trump, would like to blame “agitators” for an anti-racist freedom struggle as old as the U.S. itself. But this was a rebellion of people who knew the victim, knew the killer, and know the score. Likewise, Korryn Gaines was murdered Aug. 1 by Baltimore police for the “crime” of asserting her human dignity. Police body cameras were conveniently absent during the siege of her apartment, but Korryn was able to communicate her last moments through Facebook. 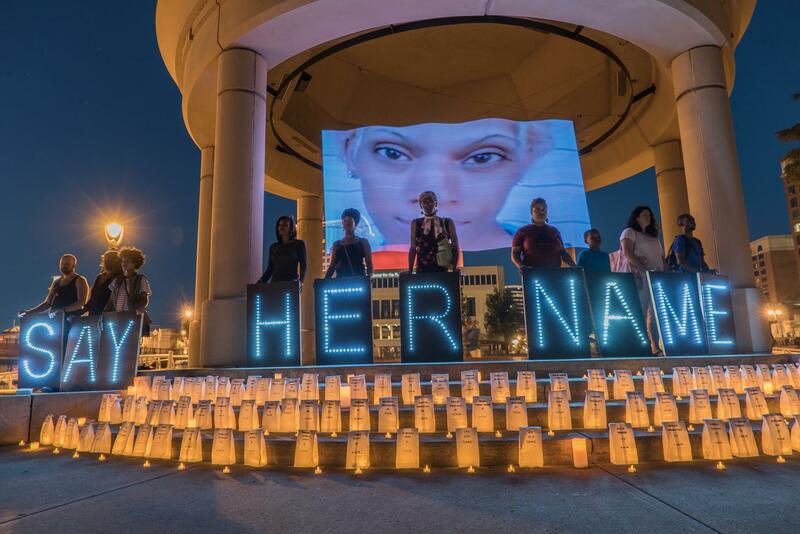 We say her name! The world is a witness to the real criminals. A Black person driving a car in the U.S., walking down the street or even in their own home, knows that if they encounter the police, they can be killed for no other reason than their color and no one will be held accountable. This is fascism just as surely as Jews in Nazi Germany knew that an encounter with a soldier in Hitler’s army could well mean death. The powers that be would like nothing better than for the Black Lives Matter coalition to lose momentum, burn out, and disappear. This won’t happen, for the simple reason that Black Lives Matter expresses the very essence of U.S. history: the Black struggle for freedom. The sharp collision of human dignity and oppression, of revolution and counter-revolution, is the defining feature in world politics. Democratic Party presidential candidate Hillary Clinton’s campaign speech on Donald Trump and the “Alt-Right,” Aug. 25, was a pointed but limited glimpse into the heart of such politics. She laid out a devastating forensic case for Trump’s campaign being connected to the full spectrum of the Far Right, racist, anti-Semitic element in U.S. and world politics. It clearly ruffled feathers in some ruling class circles. It should have screamed out: There is no room today for business as usual! But hers was a limited analysis by a politician who remains a member of the ruling class. It’s true that Trump relates himself to the racist, anti-immigrant religious bigots of the European Right. It’s equally true that those parties look to Russia’s President Vladimir Putin as a model and patron. It is disingenuous to claim that the appeal to racism is anything new for the Republican Party, much less that it’s a foreign import. The Republican Party under Richard Nixon adopted the racist “Southern Strategy” in the late 1960s, making an appeal to those white voters who objected to the social changes in the wake of the Civil Rights Movement. Nixon rode that reactionary horse to a landslide victory in 1972 that made the Republicans a model for every aspiring Far Right party in the world. It also went far toward empowering the most reactionary elements in the Democratic Party. Under Ronald Reagan, in line with the laws of capital accumulation, this reaction extended itself to open attacks on the labor movement and basic social programs. Along with Thatcherism in Britain, it ushered in a major right-wing trend in world politics that even polluted the atmosphere of the Left itself. The particular “Alt Right,” U.S. and European, that Hillary Clinton was attacking built on this history. It congealed behind the myth of a “Christian Western civilization” that supported George W. Bush’s militarism. It was a barely coherent, internet-spread mess that misappropriated great figures from Roman poet Virgil to George Orwell, conflating them with bigots like Pim Fortuyn. It disintegrated into its fundamental racism following the election of Barack Obama, and its influence on Norwegian mass murderer Anders Breivik’s anti-immigrant manifesto was clear to see. At this moment it is necessary to be clear about what we are seeing. The old cliche that “both parties are the same,” despite its element of truth, misses the main point. We are seeing something new. If one side of that is Trump’s open appeal to fascism, the opposite side is the resistance to racism and capitalism that reached new levels in the Black Lives Matter coalition and the “socialism” of the Bernie Sanders campaign. There were actually signs of a Black and labor coalescence in the vote for Sanders, especially among youth—including Latinx and Muslim youth. Sanders often failed to address this part of his base adequately—but the youth who expressed themselves for socialist politics count for more than any particular candidate. 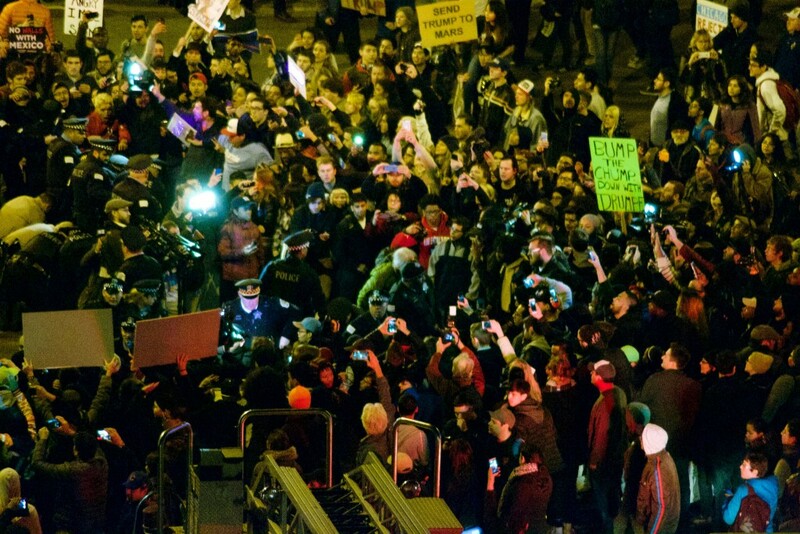 Throngs of youth, Black Lives Matter activists and others close down Donald Trump’s rally at the University of Illinois in Chicago on March 11, 2016. Photo by nathanmac87. That reactionary movement is seen in the celebration by a section of the Left of new Philippines President Rodrigo Duterte. It shows the consequences of a failure to grasp the present stage of capitalism and its politics. Duterte, sometimes compared to Trump, celebrated his inauguration by encouraging the mass murder of drug users. Police break into the homes of those accused, handcuff and beat them, terrorize their families, and summarily execute them. Personal scores are being settled. Doubtless, in many cases the drug trade is being centralized in the hands of the police. Killings will continue. 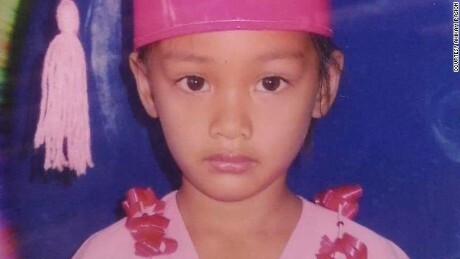 So far over 2,000 have died, including five-year-old Danica May of Dugupan City, killed by vigilantes aiming for her uncle. There aren’t nearly enough treatment facilities to serve the Philippines’ addicted population, many of whom are desperately poor. Those who are attempting to access help are also marking themselves for possible execution. In the words of human rights lawyer Jose Manuel Diokno: “Law officials are acting as judge, jury and executioner. We might as well abolish our courts.” Does anyone object? The U.S. has announced that it will increase the number of its military bases there. A section of the Left praises a new peace agreement between Duterte’s government and the Maoist insurgency—a force whose own history of internecine assassination will make it an ideal vigilante group. This fascistic tendency isn’t just dictated by ideology—it crosses those borders easily enough—but by the needs of capitalism itself. That can be seen in the intensifying attacks by the Chinese Communist government under Xi Jinping on independent publishers, writers, activists and artists. Attacks are concentrated on publishing companies that print political works, as with the arrest of the publisher of the book Godfather of China Xi Jinping, or of the five editors of the Mighty Currents imprint, which published books critical of the wealthy elite. Human rights lawyers are also a focus, with hundreds arrested and dozens kept in detention. This repression reflects worry among China’s Communist Party elite about the continuing strike wave among workers in construction, transportation, mining and manufacturing, coupled with lack of growth in the world economy. Across the disputed East China Sea, right-wing Japanese Prime Minister Shinzo Abe has pushed for an expanded military force projection capability. He is a member of the cult-like Nippon Kaigi organization that supports doing away with Article 9 of the Constitution, which states that “the Japanese people forever renounce war as a sovereign right of the nation and the threat or use of force as means of settling international disputes.” They oppose equal rights for women, GLBTQ people, and immigrants. In line with this Japan has seen a rise in anti-immigrant organizing, sometimes inspired by the U.S. Tea Party. The retrogression and rising fascism that characterize politics today is exemplified as well in the rise of Prime Minister Narendra Modi and his Bharatiya Janata Party (BJP). It represents a brutal backwards movement in Indian democracy. 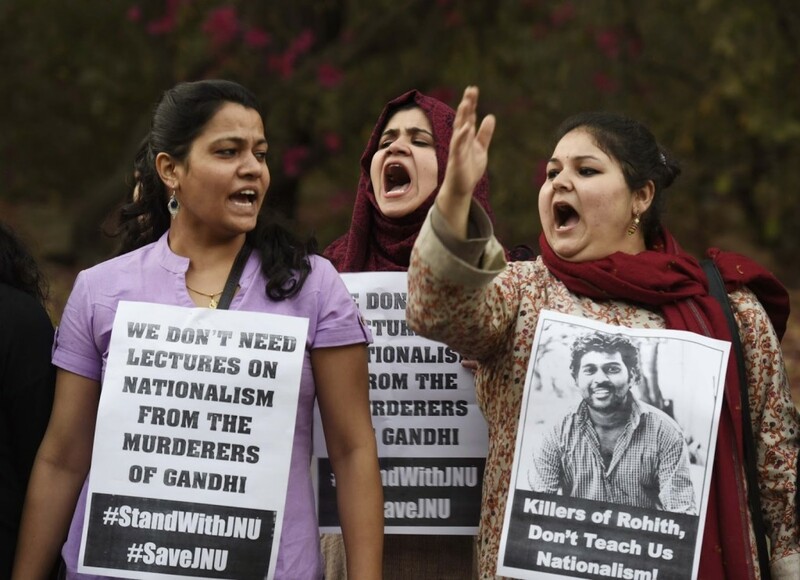 The exacerbation of Hindutva religious chauvinism, manifest in an emphasis on caste distinctions and in historical revisionism that eliminates the role of non-Hindu minorities, has now led to situations in which Dalits (“Untouchables”) have been flogged for skinning dead cows, or Muslims beheaded for eating beef. This is a defense of human dignity that resonates with Black Lives Matter and other freedom movements in the U.S. or with those in the Arab Spring revolutions. In Gujarat in August, Dalits in Modi’s home state of Gujarat challenged the mounting oppression with a Freedom March (azadi kooch) traveling through 300 miles of villages. Indian-occupied Kashmir also saw 68 civilian protesters killed by Indian troops, and a strike shut down schools, colleges, transportation and businesses. Independence-minded Kashmiris who created the azadi movement, have for decades been overshadowed by the competing nationalisms of India and Pakistan. Today, as Modi’s government attacks education through corrupted history, Indian occupation troops seize school buildings throughout Kashmir for military garrisons. Modi is hardly alone in his anti-Muslim politics. The demonization of Muslims has been a factor in European politics since the struggle against genocide in Bosnia. That genocide found apologists on both the Right and Left. Today the same propaganda networks have organized to demonize the millions of immigrants fleeing from wars in Afghanistan, Iraq, Yemen, Sudan and especially from Assad’s genocide in Syria. This May, Austria came within a whisker of electing Norbert Hofer of the Freedom Party as president. Far Right, anti-immigrant parties have increased their vote totals across the continent, and hold various offices in France, Hungary, the Netherlands, Greece, Switzerland—all of whom greeted the reactionary “Brexit” vote in the UK with wild enthusiasm. Like Donald Trump in the U.S., this represents the dream they have of finally co-opting the working class majority for their own oppressive project. By no coincidence Brexit supporter Nigel Farage has campaigned side by side with Donald Trump, both in the UK and in the U.S. In all these cases, what we are seeing is a form of oppressive politics that expresses the current state of capitalism itself. As always, imperialism flows from the fundamental logic of class relations under capitalism. Today it contains the vicious combination of a ruling class united against revolution everywhere, and, at the same time, directing an appeal to racism and narrow nationalism that portends future inter-imperial world war. It’s of the utmost importance that youth, multicultural populations, and large numbers of workers rejected the UK Brexit vote, and it will be even more important for Donald Trump to lose the November U.S. election by the largest possible margin. His attempt at a civil war—and that is the meaning of his appeal to “Second Amendment people” and the calls to jail his opponent—must end in disaster for the Far Right. This won’t be enough, of course. We are living through one particularly crucial episode in what Marx identified in 1848 as “the more or less veiled civil war, raging within existing society, up to the point where that war breaks out into open revolution…” Only revolution in permanence will end that war. Clarity is needed. We see this fascist project being carried forward in various forms throughout the world, and we see the resistance to it—as unflinching and adamant as Black Lives Matter, striking U.S. prisoners, the Ayotzinapa families in Mexico, the revolutionary communities in Syria, or the Chinese intellectual unbowed in her cell. This entry was posted in Articles and tagged #Caste is Not a Rumour, Afghanistan, Alt-Right, Anders Behring Breivik, anti-immigrant, anti-Muslim bigotry, anti-racist, anti-Semitism, Arab spring, Austria, Ayotzinapa movement, Baltimore Maryland, Barack Obama, Bashar al-Assad, Bernie Sanders, Bharatiya Janata Party, BJP, Black Lives Matter, BLM, body cameras, Bosnian genocide, Brexit, Britain, Capital accumulation, China, Chinese Communist Party, Christian Western civilization, Civil rights movement, Civil War, counter-revolution, Dalits, Danica May, David Clarke, Democratic Party, Dialectics of Black Freedom Struggles, Donald Trump, Drugs, East China Sea, equal rights BLBTQ, European Right, far right, France, Freedom Party, George W. Bush, Gerry Emmett, Godfather of China Xi Jinping, Greece, Guangzhou, Gujarat, Hilary Clinton, Hindutva, human dignity, Hungary, immigrants, imperialism, India, Iraq, Japan, Jews, Jose Manuel Diokno, Karl Marx, Kashmir, Korryn Gaines, labor, labor movement, Latin@, Latinx, Maoist, Marxist-Humanism, Mighty Currents, militia movement, Milwaukee Wisconsin, Muslim, Muslim youth, Narendra Modi, narrow nationalism, Nazis, neo-fascism, Nigel Farage, Nippon Kaigi, Norbert Hofer, Pakistan, Philippines, Pim Fortuyn, racist, Republican Convention, Republican Party, revolution, revolution in permanence, Richard Nixon, Rodrigo Duterte, RohithVemula, Ronald Reagan, Second Amendment, Shinzo Abe, Southern Strategy, strike, Sudan, Switzerland, Sylville Smith, Syria, Tang Jinglang, Tea Party, Thatcherism, The Netherlands, U.S., UK, United Kingdom, Vladimir Putin, war, We Say Her Name, white supremacy, Working class, Xi Jinping, Yassin al-Haj Saleh, Yemen, youth. Bookmark the permalink. Excellent summation of the frightening specter of the rise of fascism in the world.